My commute by bike is usually on city streets, but I decided to detour through some lovely area trails this morning. The view was breathtaking. I passed within five feet of a gorgeous falcon which sat perched on a signpost. He just swiveled his head looking at me as I biked by. 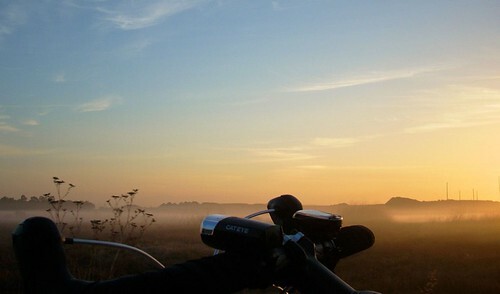 I can’t describe the feeling of watching the sun rise and the shore birds flock as I ride silently through the low fog. Does your commute take you through areas of natural or man-made beauty that is perhaps not accessible or appreciated from inside of a car? My commute definitely takes me through some beautfiul areas. I go parallel to a river and the glistening morning light, fog, or steam off the river is always amazing. As I ride I’m thanking myself for not driving. When I drive, I also go along the same river, but I’m detached and wishing I were closer and had time to stop and take photos. I typically commute to work almost entirely by surface streets, aside from a brief section of trail at the end. On the way home, though, I started going a few blocks past where I would normally turn onto the arterial and taking neighborhood streets, which adds some time but also allows me to ride through two small but pleasant parks. My area tends to have some… ethnic clustering, I guess you could call it, and so on the way home at dinner time I go through areas that smell like teriyaki, indian curries, and finally I pass behind my favorite chinese vegetarian restaurant. I’m always ready for a good dinner by the time I get home! If I were to commute the entire 18 miles to work here in Phoenix’s East Valley suburbs, my route would take me along the path on Tempe Town Lake’s south shore. While being very urban, it is still gorgeous, and inaccessible by car. There are also a few scraps of orange grove remaining here and there among the suburbs where I live. And I could modify the route a little and take in a canal path. Every evening, however, now that the commute home happens after dark, my suburban bus-to-home commute goes past a grassy park, a canal, and sometimes a golf course. Here in the desert (where, I might add, most people do not maintain lawns but instead have landscaped gravel areas in front of their homes) at night the air temperature drops and the air smells better near water and growing things. On a bike, this is heavenly. In an enclosed car you would never notice. I remember the same commute years ago in a convertible I’ve long since sold, before the big orange groves were replaced by subdivisions, and the air did the same thing on a much larger scale, with an added bonus when the trees were blooming. It sounds like you have some nice commute routes also. Thanks for the comments. Damn, I miss baylands. I used to work out near there in Mtn. View and used to either ride right after work, or after my afternoon nap (I worked 4am to Noon). I loved riding out there at dusk time also. And the wind always made it a good workout. You could almost always count on 7-10 mph out there on the bay. Ugh I hate being back on the cold.rainy. east coast.